Are you the healthy guy? 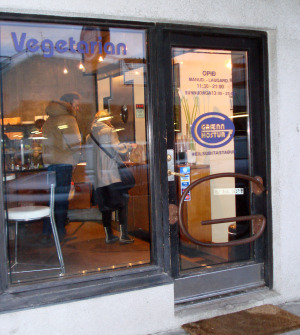 If so we have several very good Reykjavik vegetarian restaurants that I personaly can highly recommend. Look at the list here below. Is a small restaurant that mainly focuses on take away food. They are situated at Suðurlandsbraut 52, tel: 553-8810. Their price range is ($). They are open working days from 11:00-19:15 but closed on weekends. 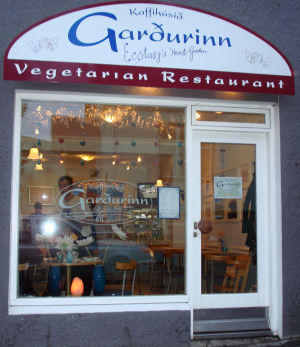 Is one of the oldest Reykjaviks vegetarian restaurants in Iceland. They are situated both down town on Laugavegur 28b and also in Kringlan (the big shopping mall). I have enjoyed many of my best meals here, they both taste good and are also good for you. The restraint on Laugavegur down town is little bit hidden because it is on second floor (no elevator), but it is well worth it. You don’t have to reserve a table but their phone number is 552-8410. Their price range is ($). They are open every day from 11:30-22:00 but on Sunday from 17:00-22:00. The Kringla restaurant is open as long as the shopping center is open. 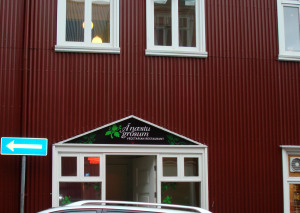 Is 100% Reykjavik vegetarian restaurant. They serve different main course every day and also have some other dishes available. They always have there delicious cake with cream for those how like that. This was my lunch restaurant for many years. Solla (the chef of Gló was then the owner of this restaurant). This is a small but very nice restaurant right down town at Skolavordustig 8, Tel 552-2008. They are open from 11:30-21.00 every day except Sundays from 13:00-21:00. Their price range is ($). Is a very popular small restaurant down town. They follow Sri Chinmoy ideology. I am told that they meditated when they are cooking, the one thing that I can tell you is that there food is on the top of the list and their quiet and relaxed atmosphere is just amazing, it makes you want to come back again and again. They are located down town at Klappastigur 37, tel 561-2345. They are open from working days from 11:00-18:30 except on Wednesday from 11:00-17:00 and Saturday from 12:00-17:00. Their price range is ($). There is both a healthfoodstore and music instrument store that both follow Sri Chinmoy ideology next door to them. Opened 2 years ago and is part of The NLFI Rehabilitation and Health Clinic in Iceland. Well the clinic is not located at the same place as the restaurant. The restaurant is located at Sudurlandsbraut 12 and they are not strictly vegetarians since they sometimes have fish or light meat as their main course. They also have a little health food store at the same location. A very nice restaurant with very good food. Tel 557-5880, they are open 11:00-20:00 all working days. Price range is ($).